Despite losing to GBN on Nov. 26, 6-2, senior captain Ryan Buckingham believes that the rivalry face-off didn’t show the men’s hockey team’s true potential for this season. While Buckingham said that having fans there is enjoyable, he is grateful for the appropriate behavior, considering the game’s annual presence was in danger. “This year’s game was important, because the Park Center was considering eliminating that game because of concerns about [inappropriate] behavior,” Buckingham said. “This year, the fans did a great job behaving themselves, so I think there will continue to be North vs. South games every year. Buckingham, along with the rest of the team, looks forward to playing GBN again on Dec. 20. Buckingham also says that the men have beaten teams that have beaten GBN, such as Providence Catholic and Waubonsie Valley. These games, amongst others, contributed to their current record of 14-9. Aside from their loss to GBN, the team was more successful against the Loyola Gold team, winning 3-1 on Nov. 20. According to senior Mike Montemurro, this game was influential in their season, because it was the first time they had beaten them in three years. The men also played Providence Catholic on Sept. 13, winning 3-2. Providence is currently ranked second in the state, behind New Trier Green. Despite their past win and best efforts, the team then lost to Providence in a tournament in Ann Arbor, Michigan over the weekend of Dec. 5. In that same tournament, the men came in third place out of 12 competitive teams, according to Buckingham. According to senior captain DK Arenson, the team is built upon the foundation created by junior goalkeeper Matt Grinde. Although the team has Grinde as a strength, they struggle with maintaining their defense, according to senior Johnny Savino. Conversely, Buckingham believes a strength the team has this season is the depth of experience through returning varsity members. The 12 returning seniors have had much influence on successful play, due to their familiarity with each other on the ice, Buckingham adds. Along with the experienced players, Coach Jim Philbin is celebrating his 20th year as head coach of the program. 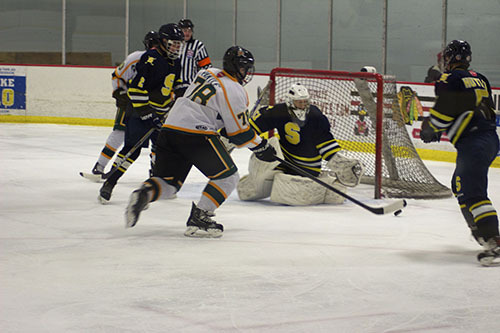 On Dec. 12, the team played Barrington and won 5-2. According to Arenson, the game was succesful as a result of Philbin switching up the lines right before the start of the game. Along with this change, Savino believes that their ability to score first and fast was influential in the win. The men next hit the ice on Dec. 20 with their anticipated re-match against GBN.